This summer I moved back to the Finger Lakes after living in Connecticut for 28 years. It’s been fun rediscovering the events and festivals that I once took for granted. One way I decided to get back to the roots of the Finger Lakes was to take in a local festival steeped in tradition and legend. So often when people think of Native Americans their thoughts immediately turn to the mid-western region of the United States, but what many don’t realize is that the Finger Lakes area of New York has a rich history of Native American Culture. This family fun event is free and a great way to spend a day. Because it’s held on the grounds of the restored 1874 Overackers Schoolhouse in Vine Valley, the building is opened for the day for self-guided tours. As a teacher, I couldn’t resist going into the one-room schoolhouse to look at how education was handled “in the olden days”. My friend, Nancy, who was visiting from Ohio, and I chuckled over some of the rules and subjects of study for students, but we laughed outloud over the rules for teachers. I thought teaching had its challenges in today’s technological age, but at least I wasn’t told what hours to keep when I was out of school and exactly how I had to conduct myself. It was fun to take that walk down memory lane, though. For history buffs like me, you wouldn’t want to miss hearing Peter Jemison, a descendent of the local Seneca tribe. 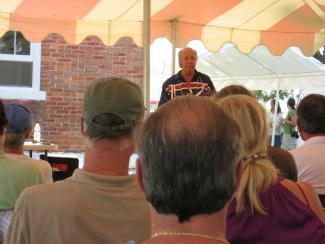 Peter is a nationally recognized Seneca historian and is the Executive Director of the Ganondagan State Historic Park. In addition to sharing the history of the Seneca tribe in the Vine Valley and Middlesex area, Peter related the story of the Great Snake that wiped out all but two members of this particular village. This story explains the many round rocks that can be found in the shallow waters at the base of Bare Hill on Canandaigua Lake – rocks that are believed by the Seneca tribe to be the skulls of those killed by the snake. Rather gruesome, I thought, but I could imagine the curious taking a trip to those waters to see for themselves. 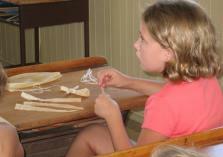 For the younger visitors who aren’t quite up to sitting through the legends, there was an opportunity to go into the schoolhouse to make corn husk dolls. This activity was fun for not only the little ones but also for the parents and grandparents who went along to “assist”. Every child walked away with a smile and at least one completed corn husk doll thanks to the volunteer teachers who guided them in this old pastime. Following Peter’s talk, Native American storyteller Ronnie Reiter regaled the audience with more legends and myths of the Seneca tribe. It was a great way to learn about the first inhabitants of the area. Later in the day there was a great deal of toe tapping and hand clapping as the Crooked Lake Fiddlers entertained with a bluegrass blend of instruments including fiddles, banjo, guitar, mandolin, hammered dulcimer, autoharp and washboard. The style of music was a perfect complement to the Heritage Day festivities because it felt so down-to-earth. In the early evening, singer/storyteller Chris Holder took his turn at entertaining the attendees with songs, more local folklore, jokes, riddles and a “retelling” of his version of the Seneca legend of Bare Hill. By the time the day was drawing to a close, I felt as if I really had a sense of what life was like before the “pale faces” took over. Of course, where there’s a festival, there’s food, and this was no exception. In the late afternoon festival goers could enjoy a pulled pork dinner while tapping along to the Crooked Lake Fiddlers or singing along with Chris Holder since these happened simultaneously. Although I didn’t have time to partake, the mouth-watering aromas certainly got my stomach growling. For the hale and hearty, the festival rounds out with the main event, a hike up Bare Hill in order to start the bonfire that signals the beginning of the Ring of Fire around the lake. (Just for the record, I did not take this hike, but I might next year.) This ritual also relates back to the original story of the Seneca tribe. According to legend, the Ring of Fire expressed gratitude for the beauty of the lake and re-enacted the celebration of the Seneca Indians who, more than a hundred years before, had lit their festival fires on Bare Hill and around the lake to give thanks for being saved from the Great Snake and for good hunting and fishing. Bare Hill is a wonderful vantage point from which to watch the lighting of the flares around the lake that create the Ring of Fire. All I could think as I was participating in these events was that if I, someone who had lived in the area for many years before moving to Connecticut, was mesmerized by the activities during this festival, then first time visitors would really enjoy it. This was an awesome day to spend out in the fresh air and sun and learn about the area’s roots. There’s no doubt in my mind that I’d go again next year; after all, I didn’t have time to make a corn husk doll or satisfy my taste buds with the pulled pork. Next year, those are on my list of things to do! Laurie Gifford Adams is a native to the Finger Lakes who returned to the area after teaching for 26 years in Glastonbury, CT. She is loving being back in the Finger Lakes where she's rediscovering all of the exciting things to see, do and taste here. Laurie is the author of the novels, FINDING ATTICUS and OVER THE EDGE, both set in the Finger Lakes, and co-author of www.RUinDanger.net, an Internet safety guide. She is also multi-published in magazines. She is also the assistant director of alumni and family relations at beautiful Keuka College, another Finger Lakes gem.